Animal assisted therapy is a way for people and their pets to help others by sharing their compassion and goodwill. Pets and their owners visit and interact with a wide variety of people that need a little extra emotional support. 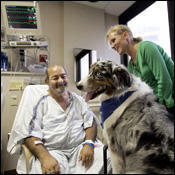 Therapy patients get a chance to pet, talk to and bond with visiting pets. It's been shown that people who spend time with pets live longer, get sick less, and have lower blood pressure. Petting and talking to animals lowers stress in people and the animals they are interacting with. It can also be a great way to lift people out of isolation and loneliness. Pets are wonderful listeners and provide unconditional love. Therapeutic horseback riding is another valuable type of animal assisted therapy that gives people an additional way to interact with animals. Take a look at some of these links we've collected for you.